Opening your front door or returning to where you parked it to see your car has been stolen can feel like the end of the world - make sure you have the right tools in order to guarantee a safe return for your vehicle. Protect your vehicle against loss through theft with Trackerfit's vehicle tracking solutions. Our premium car tracker technology is designed to aid the recovery of stolen vehicles, and get your car back to you as quickly as possible. Surrey has a reputation for being a low-crime county. In recent years, it has reported the lowest crime rate in the UK on several occasions. 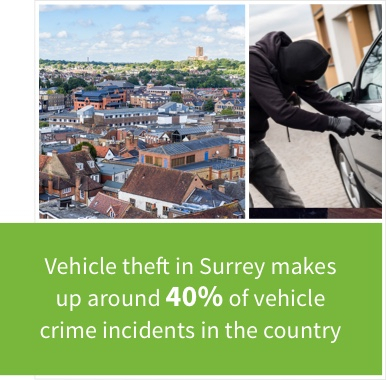 However, car crime is one of the most prevalent offences in Surrey, with theft from a vehicle making up around 41% of all recorded vehicle crime incidents in the country. Surrey is one of the more affluent areas of the UK, which means there are more high-value cars on the road. This makes it attractive to opportunist thieves, but also car theft gangs who target specific, often high-end, cars and vans. One particular local problem is two-in-one burglaries, where thieves access the home to steal goods and take the car keys, driving away in the occupant's vehicle. Car theft is a worry for any car owner. It doesn't matter how well insured your car may be when a car is stolen, it is an expensive inconvenience at best and a financial catastrophe at worst. Claiming for your stolen car can push your insurance premiums up, not to mention the costs for alternative transport following its disappearance and for replacing your car. There are many steps you can take to protect your car against thieves, including installing alarms and locking it safely in a garage overnight. However, car thieves can strike anywhere, anytime and they are often highly skilled at their craft - you cannot protect your vehicle all of the time. In the event that your vehicle is stolen, you hope for a swift recovery of the car as soon as possible. Hopefully, this will occur while the offender is still driving the vehicle. 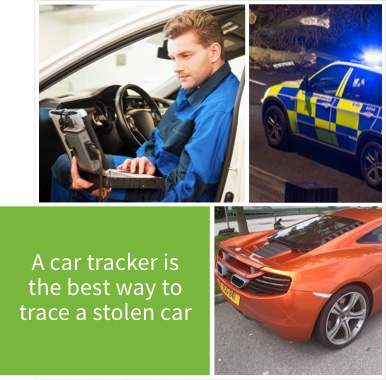 A car tracker is the best way to trace a stolen car, and Trackerfit is a leading provider of stolen vehicle tracker solutions. Our car trackers are small and discreet, reducing the chance that the thief will spot and remove it before driving away. They are activated when illegal vehicle movement is sensed and/or when you report the theft. A 24-hour manned control centre traces your vehicle and follows its movements, reporting back to the police the whole time. This allows officers to act quickly to find and recover the car and return it to you. The peace of mind a tracker can bring is invaluable, and it could save you a great deal of money down the line. 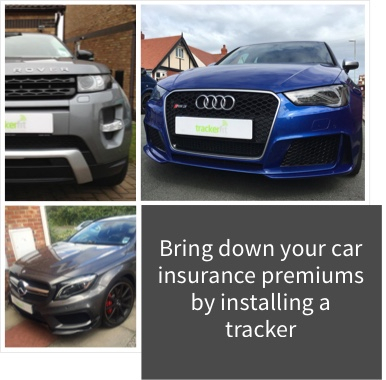 Ensure that thieves cannot take away your vehicle by contacting Trackerfit today and requesting more information - or by ordering your car tracker online right now.